Scottie Ventures began as a byproduct of six Carnegie Mellon students' growing interest in venture capital. 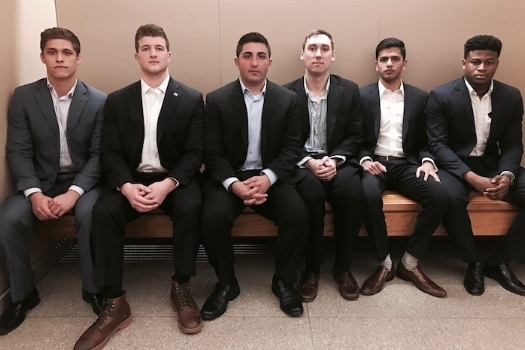 After a strong performance at the National Venture Cup, these students came together to start Scottie Ventures, an investment group that would focus on teaching the principles of venture capital to interested community members. Scottie Ventures quickly gained traction in the Pittsburgh area. Aspiring venture capitalists and entrepreneurs alike joined the Scottie Ventures team, and the group grew to over twenty members. Now, the Scottie Ventures team teaches weekly lessons that are hosted on Carnegie Mellon's campus. Over the course of time, Scottie Ventures has developed relationships with a number of VC firms. This allows members of Scottie Ventures to get relevant work experience by creating market landscapes, competitive benchmarks, and industry reports for career VCs. Our story is one of intellectual curiosity. Scottie Ventures was started because of students' desire to collaborate and learn. And by making our excitement known to the world, a much larger network and opportunity was born. Now, we're excited to expand the impact that Scottie Ventures has in the Pittsburgh community. A key element of Scottie Ventures is experiential learning. As such, members of Scottie Ventures get the rare opportunity to work with career VCs. The Scottie Ventures team is always happy to scale its program, so please feel free to contact us with any partnership inquiries. While Scottie Ventures is focused on education, the team does have access to top-tier funding sources. Our collective network includes a variety of pre-seed, seed, early, and growth stage firms. Therefore, the Scottie Ventures team is always happy to review prospective investment opportunities and connect promising entrepreneurs with the financing that they need. Additionally, many members of the Scottie Ventures team have experience in technology, consulting, and business development. As such, if you're an entrepreneur that needs help with research, marketing, partnerships, customer validation, budgeting, fundraising, or legal work, we can probably help. We'll be there for you when you need us, how you need us. Our goal is to empower the next generation of entrepreneurs so that they, and their technologies, can succeed. Please feel free to shoot us a message that describes your needs, and a member of Scottie Ventures will get back to you as soon as possible!